I love candles, as many people do. There’s nothing more relaxing to me after a long day than pouring a beverage of choice, lighting a candle and climbing in my bed to watch the flames flicker. I use scented candles for that, mostly ones I get off Etsy as I prefer reasonably priced soy candles. Aside from my scented candles, I light what some call a 7 day candle. I light these on weeks I’m working on something specific for myself such as healing, manifestation, cleansing and purity. These candles come in a myriad of colors and each color such as white, red, green, pink each have a specific purpose such as attracting money or good luck, love and attraction depending on what you’re looking for. 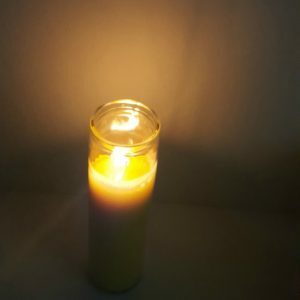 There is a metaphysical shop in my city that sells every color candle imaginable but it’s across town and not as friendly on my pockets.So the plain yellow candle you see above was purchased from Dollar Tree where I get most of my 7 day candles. Usually at my local Dollar store I can only find white or blue candles. so when I finally found a yellow one. I threw that bad boy in the cart with no hesitation. I had no particular purpose for it at that time, I just bought it because it was a dollar and a shiny yellow candle I’ve never come across before in the store. So after sitting in my closet for a few weeks something told me to bring it out this week and let it go to work. 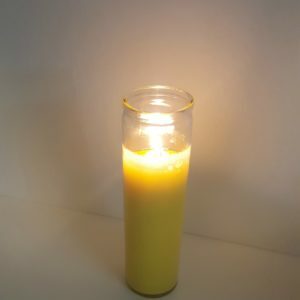 Yellow candles are good for facilitating creativity, mental clarity, bringing plans into action as well as realizing and manifesting thoughts. I’m on the verge of many new beginnings in my life right now (work, school, and relationships) and felt it was the time to light my candle. My focus this past week was manifesting. Now, while I don’t do spellwork, (there’s nothing wrong with it, just not my thing), I do like to throw my intentions out to the universe. My focus this past week was manifesting so I lit my candle just because I felt like to give bringing my needs and desires into fruition a little oomph! I light my candles after I wake up and let the dog out to handle her business on Sunday mornings. I bless my candle and ask God and Archangel Michael to remove any negative energy and energy that does not serve my purpose from the candle. I find it important to do this because you don’t know who touched the candle before you and you don’t want their energy to carry over. Next, I go over some bible verse specific to what I’m trying to work on. Once done, I purpose the candle with my specific intent then light it. I let the candle burn all Sunday long until bedtime. I then light the candle again when I get home from work each day until Saturday when the candle usually goes out. Once it goes out, I thank it for it’s help in attracting what I want into my life and send it on it’s way.